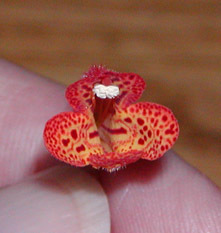 Sinningia nordestina is a tropical species with bright, spotted flowers that resemble a kohleria or smithiantha. Growing several in a clump can help to support the stems. This species may have a short lifespan. Some growers find it difficult. Mauro Peixoto introduced this species to North America by distributing seed at the 2002 AGGS convention. 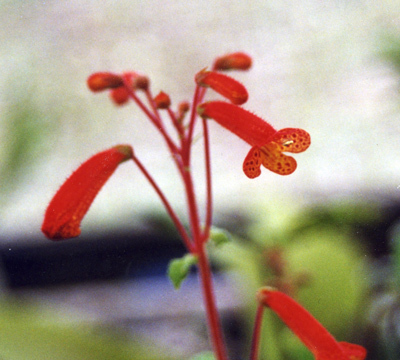 It has small but very striking red-and-yellow flowers. 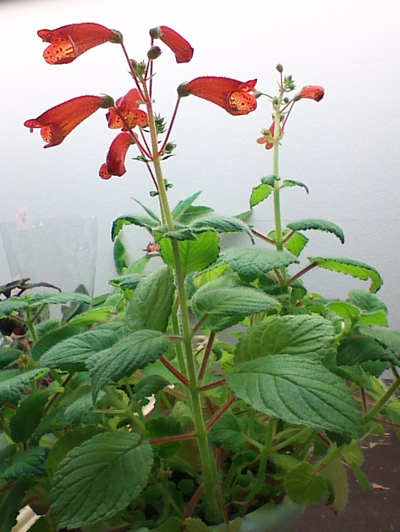 This is Ginny Heatter's picture of her own plant. Some growers get lax plants with floppy stems, but this well-grown plant has sturdy stems and larger leaves. This picture was taken in Mauro Peixoto's greenhouse (his plant) in 1999. 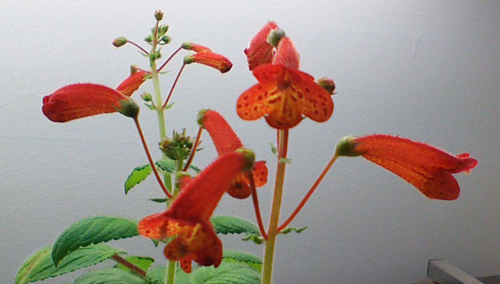 This is from Ginny Heatter's picture of her own plant. One of the reasons that Sinningia nordestina has gotten the reputation of being an annual is that it comes out of dormancy at an unusual time of year. In 2007, mine sprouted in early August. Toshijiro Okuto, on the Gesneriphiles mailing list, wrote that his tuber regularly came out of dormancy in July. The other reason for its reputation as an annual is its short lifespan. Sometimes it is an annual! Sometimes it doesn't come out of dormancy. This lack of longevity seems to apply to its hybrids too. John Beaulieu and I have created hybrids with this species, and the hybrids bloomed, but they have all since died. Sinningia nordestina grows in really tropical conditions. It was first discovered in Pernambuco state (Brazil), much closer to the equator (about 8 degrees latitude south of the equator) than most sinningia species. It is therefore unlikely that it can tolerate cold temperatures, even if it does not freeze. The unusual growing period (sprouting in mid-summer) is due to the difference in dry season between northeast Brazil and the southern states where most other sinningia species grow. In the original publication, it was speculated that this species was probably intolerant of drying out, and that the tubers would not resprout after a prolonged dry period. My own experience with cultivated seedlings suggest that even young tubers given very occasional watering (e.g., once a month) will eventually sprout. The fact that the tubers sprout so late in the growing season would certainly make it seem as if the plants were never going to come back. On the other hand, I have not kept them completely dry until new growth appeared; most sinningia tubers do not require any water at all during dormancy. The original publication also noted a number of seedlings near the wild plants, and suggested that this species relies on abundant seed production for survival, much like an annual. This matches my observations. The plants readily set seed, and the seeds germinate in profusion. As far as I know, John Beaulieu was the first to get a S. nordestina hybrid. He posted a picture on the Gesneriphiles mailing list of his S. nordestina x sellovii. The hybrid had the pendant flowers of S. sellovii and the general inflorescence appearance of S. nordestina. John's message said that S. nordestina was the seed parent. Unfortunately, John could not keep the hybrid plant alive. This is consistent with my limited experience too, that hybrids of S. nordestina are not easy to maintain. Perhaps that is a result of the low life expectancy of the species. Let this be a challenge to all you expert hybridizers. Get those beautiful red-and-yellow flowers on a sturdier, hardier, more durable plant! I crossed S. nordestina with S. araneosa, and got one seedling. 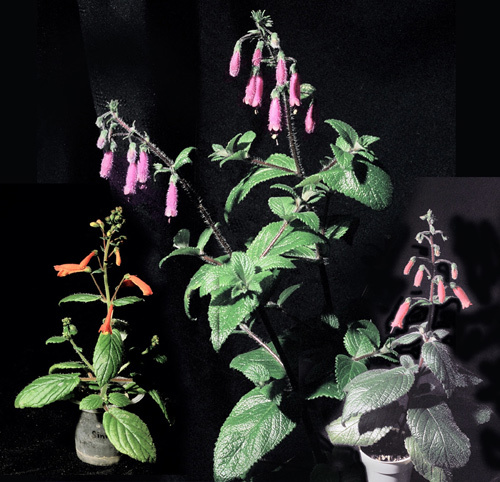 John Beaulieu's picture of his own plants. From the left: S. nordestina, S. sellovii, and the hybrid between them. Dormancy This species has a long dormancy period. It tends to emerge from dormancy in mid-to-late summer (August in the northern hemisphere). Tip cuttings taken during the growing season might not go dormant. From seed Bloomed within 12 months, under my conditions. Be patient with the seed; mine usually takes two months to germinate. Hardiness This species is from a tropical area of Brazil, so it is very unlikely to be hardy. Propagation From tip cuttings or seed. Recommended? Try it at least once! The flowers are small, but there's nothing like them in the genus Sinningia. Collect seed, so you can restart. Taxonomic group By itself in the Corytholoma clade. Mauro Peixoto's Brazilian Plants site has a page about S. nordestina. This species was published in 2000 by Alain Chautems, George S. Baracho, and José A. Siqueira Filho. The second- and third-named authors discovered living specimens of this species in Pernambuco state (Brazil) in 1996. Etymology: "north east". Presumably from Nordeste, the northeast region of Brazil, which includes Pernambuco state. Classical Latin for north is septentrionalis, from septem (seven) and trio (plow ox), describing the Big Dipper. You only have to say septentrionalis a few times while trying to give somebody directions to appreciate why the heirs of the Roman Empire adopted the Germanic word for north. Latin east was oriens (rising, beginning) from the same root as origin. In many languages, the words for east and west are ultimately derived from roots having to do with the rising and the setting of the sun.